Long story short, I'm about to dip into film by purchasing a Pentax ME Super. My photography is strictly hobbyist, and is almost exclusively done while hiking, so weight and size are important. The ME Super seems to hit those points pretty well, and will accept a wider range of adapted lenses than similar compact SLRs (OM1, Nikon FG), and is a reasonable price to start a new hobby experiment with. Feel free to convince me the Pentax ME Super doesn't make sense for my needs). I have a nice Takumar 28mm f3.5 I used to use with my gh3 before it got stolen. I want something on the longer end - I'm guessing 85-100mm (not certain) though to supplement as a second lens. So I'm after a lightweight, compact, fully manual legacy telephoto. There's a lot around in the m42 and k mount, so any guidance would be appreciated! The Nikon E 100mm is meant to be a very impressive (for its size, weight and price) lens. Some people seem to have had success mounting older Nikon F lenses on their Pentax cameras - I'm not sure if this would work on this particular lens? I can't find any accounts of people doing it with E series lenses. I'd stick with K lenses personally, I prefer the full functionality on film bodies. I had a Takumar Bayonet 135mm f2.5 that would made a great mid-telephoto walkaround lens. Cheap and my copy made nice photos. The Pentax m85f2 is very compact. I have a converted nikkor 105 ai and ais. I also have a takumar 150 which isn't much bigger. Judging by the weight of the tak 105 2.8, 250g it must be small. If want reach that is very light for the focal length, try the 200mm & 300mm tele Takumars. They are small, lightweight, excellent, and inexpensive. I have both. Also the factory hoods reverse and store over the lens barrel. In storage it has a small size with a hood. The M 135 f/3.5 is compact for a 135mm lens. Combined with my ME Super, the pair weigh 716g (without film ). Plus 1 for the tele tak 200 5.6. It is easily the best combination of long focal length and weight. Another good weight saver I use for hiking is the A 50 2.8 macro - giving you a good medium length lens plus that macro option when that inevitable flower turns up. It is quite a light lens. If you are not too concerned about the speed, there is a jupiter 11(?) 135mm f4 which is very small and light. I haven't tested it too much, but from what I have seen it's not bad. And it's cheap too. I gather you are looking for a modest FL telephoto, something of roughly 70~150mm focal length. Don't overlook macro lenses in this range. There are many, many of them out there and almost all of them have excellent IQ for general photography. At the long end, Pentax made a decent 150mm f4 that is not common, but has a decent reputation. I would echo .a.t. here I am very happy with my 135 on my ME Super. Also a 135 should be easy to find at a good price. I picked mine up in a charity shop (here in the UK) and have seen several since. The SMC Pentax-M 100 f/2.8 lens is excellent all-around. If you are patient you can find a nice one for about $100. 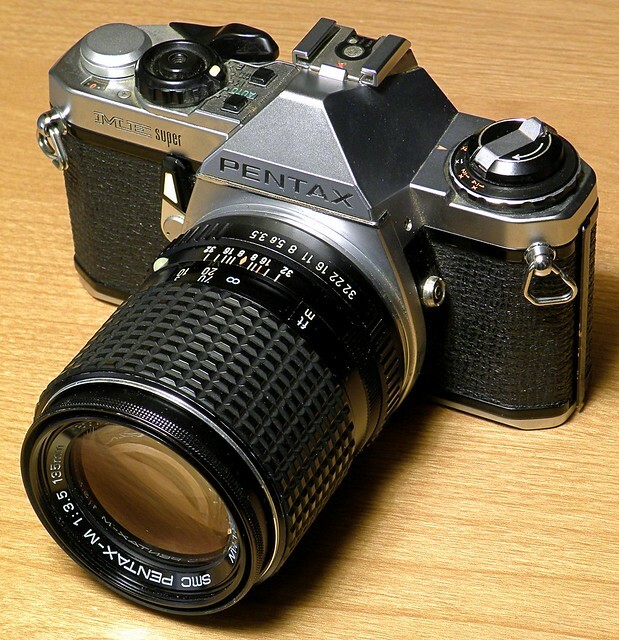 The pentax m 100 f2.8 is a fantastic lens and quite small. Long ago I gave mine along with a k1000, an A 28mm 2.8 and an A 50mm f2 to a friend's daughter studying photography. She ended up in another visual art but I think that certainly helped her along. I do wish she'd sent them back lol. I consistently advocate the tamron adaptall 90mm f2.5 SP macro #52B/BB as one of the best price/perfomance options available. Go up to 135mm - much better focal option on 35mm film than aspsc digital - and there are a huge range of good lenses around including Jupiter/Tair/Carl Zeiss Jena/Tamron adaptall/Vivitar close focus/Pentax's/Taks/... Both the CZJ and the Jupiter 37A are compact and quality, tho not particularly fast at f3.5, and being M42 or t-mount-type wont have auto aperture.. Smallest zooms: tamron adaptall 58A 70-210mm, tokina SD 70-210mm, both not bad... but not great either. Last edited by marcusBMG; 04-09-2018 at 06:27 AM. I will +1 the comment by marcusBMG. Almost all macro lenses in the 90~105mm range are excellent modest-size telephotos. The Tamron 90mm macro has had an outstanding reputation going way back to its original introduction. There are many copies of many versions available on the market, and any one of them would be a good choice.